For the past two decades corporate governance reform in Europe has been guided by the ‘shareholder value’ model of the firm. That model is now discredited as one of the major causes of the financial and economic crisis. 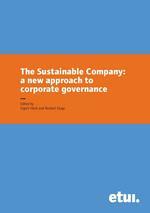 In this book an alternative approach to corporate governance is presented by members of the GOODCORP network of researchers and trade unionists. This new approach, entitled the Sustainable Company, draws on both traditional ‘stakeholder’ models of the firm and newer concerns with sustainability. The main elements of the Sustainable Company and the institutions needed to support it are presented. Key themes in the book are the need for worker ‘voice’ in corporate governance and for a binding legislative framework to promote sustainability. Individual chapters deal with the issues of worker involvement, employee shareholding, sustainability-oriented remuneration, international framework agreements, NGO-trade union relationships, reforming financial regulation and carbon taxes and emissions-trading schemes.